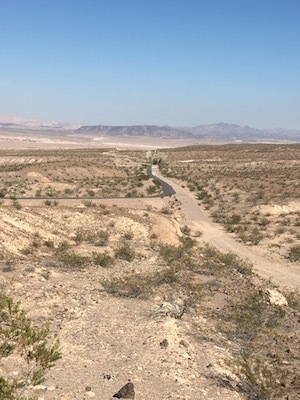 This recently completed, 34-mile trail in the Las Vegas Valley surrounds the River Mountains, connecting Lake Mead National Recreation Area, Hoover Dam, Henderson, and Boulder City. The hilly, paved path is a great opportunity to run off-road and enjoy some spectacular views. There is quite a bit of variety on this trail, and some spectacular terrain. The closest access point to Las Vegas is in Henderson, about a 1/2 hr. drive from the Strip. Naturally, runners won’t do the entire trail — here are some of out most recommended sections, starting at Park at the River Mountains Bike Shop (Mile Marker 10), on Lake Meade Pkwy. There are mile markers every 1/2 mile. Anywhere along the 14-mile stretch (mile markers 10-24) between the River Mountains Bike Shop, on Lake Meade Pkwy. Heading east, it’s mainly downhill, with spectacular views of Lake Meade. 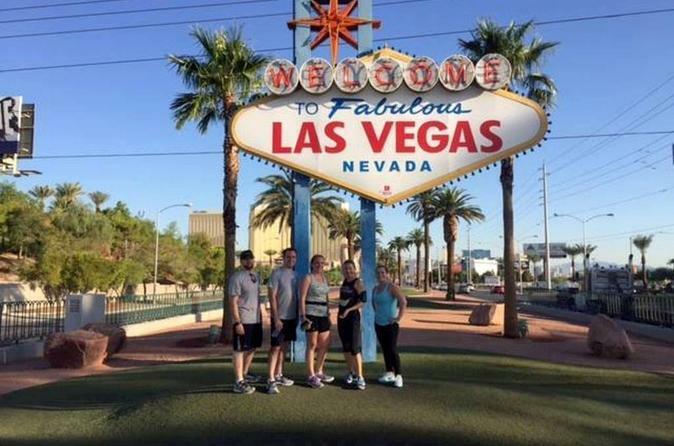 Mile markers 17-24 of that stretch are the flattest section of the trail, as you run along Las Vegas Bay. One good option is to park at the Lake Mead Visitor Center and run north of Mile Marker 24, for a few miles. 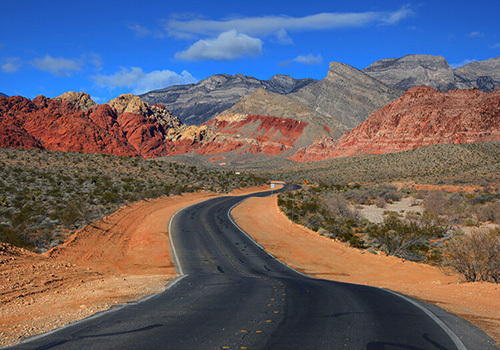 The 6-7 miles between I-515 and Lake Las Vegas (Mile Markers 3-10), are also mainly downhill, heading northward, with a few quick, steep climbs. Great mountain views, and especially nice at the end of the day, with the sun at your back and wonderful light. There are several trailheads along the path. Note that some sections are very hilly, and that the entire trail is exposed — there is little shade, so plan accordingly and bring water! Darryl at the River Mountains Bike Shop can offer helpful advice, and the store has a great selection of bikes to rent, plus good drinks and snacks. 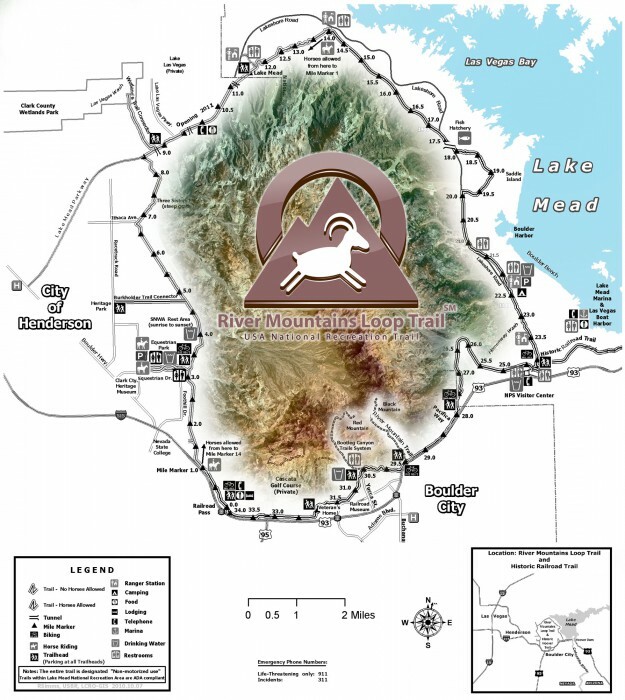 Note: A section of the trail near Lake Mead, mile markers 17-20, is closed. In this section, you must run on Lakeshore Rd., which has a good shoulder.